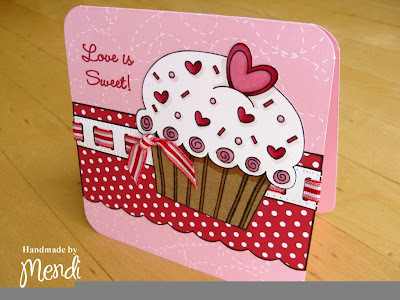 Supplies: Hero Arts Stamps (Cupcake/Polka-dots), CK Puppy Love Font, Copic Markers, Stickles & Diamond Glaze. 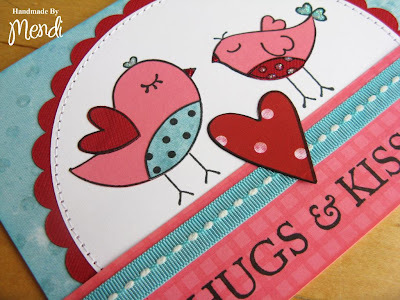 Supplies: Hero Arts Stamp, Copic Markers, American Crafts Paper, Fiskars Border Punch, Stickles, Diamond Glaze. 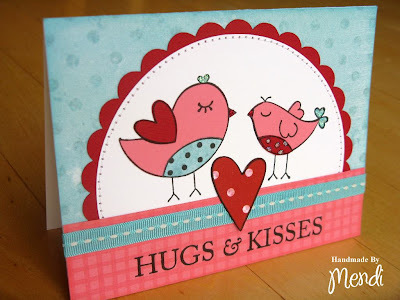 Supplies: Hero Arts Stamps (Hugs & Kisses, Birds & Stripes), Versafine Ink, Stickles, BoBunny Paper. I am completely in love with Hero Arts new stamps! I have a mile long wish list. I bought these birdies on an impulse buy yesterday. They weren't even on my list, but when I saw them this card idea popped into my head. 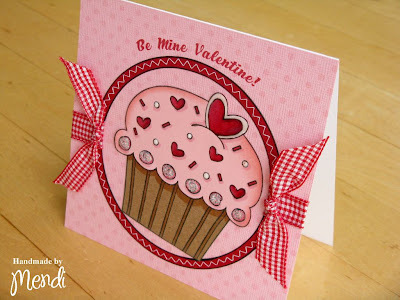 I also treated myself to this striped background which I saw in their catalog can be turned into checks just by stamping it in two directions. So clever!